The Physics Groupie Blog: Yellow Books Rule! I love the Yellow Books. For those of you into math, you know what I mean, the venerable series of mathematics texts from the Springer-Verlag publishing company. They come in all sizes, hardback and paperback, with a broad variety of topics, but the thing they have in common is that they are yellow (the most advanced ones have “Graduate Texts in Mathematics” in a white field on the top part of the cover. The yellow books represent the best of the best in mathematics. I own a growing collection of yellow books and I buy them every chance I get, especially when I find them on sale or when they are in good used condition. There is a local independent bookstore called Alias Books (http://www.aliasbooks.com/) near my clubhouse office in West LA and I’ve told the owner that I’ll likely buy any yellow books he brings in. I’ve found some good ones there too, like “Tensor Geometry” by Dodson and Poston. I like that one because so much of general relativity depends on tensor algebra and calculus. So instead of paying near $100 per book, I can get an excellent used book for less than half that price. A couple of years ago, an amazing independent bookstore in Santa Monica called Midnight Special closed after many years of serving the community. The store was one of very few that carried an extensive collection of yellow books. I would spend hours checking out their stash. During their going-out-of-business sale I found a bunch of excellent yellow books. I hated to benefit that way as result of the demise of a good bookstore, but all’s fair in love and math. Another great resource for yellow books WAS the Caltech bookstore. The store had a huge selection of math and science books, but alas in May 2009, unbelievably Caltech decided to close their campus bookstore. All student textbooks must now be purchased online. This was a big disappointment to me because I looked forward to my bi-monthly trips to the campus to peruse all the yellow books they had in stock. 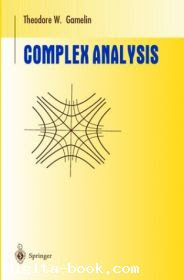 One of my favorite yellow books is “Complex Analysis” by Theodore Gamelin (to buy this book, check out the math section at http://www.quarkbooks.com/). Dr. Gamelin was a professor of mine while I was an undergrad at UCLA. I took the Game Theory and Linear Programming class with him. Isn’t his last name just perfect for teaching that class? I can still hear him saying the word “tableau.” Dr. Gamelin recently retired from teaching. He will be sorely missed I’m sure. Anyway, getting back to his book, I recall seeing at least two people reading the book at local Starbucks coffeehouses here in LA. Imagine that, in a town of Hollywood glitz and screenwriters at every turn, there are some thoughtful souls reading math books, in public no less! I really love that. So now I carry my Complex Analysis yellow book in the back of my car. You never know when the urge might come.